SOME YEARS AGO I was asked in an interview if I had any particular ambition, and I remember answering that I would like to write a classic fantasy for ten to twelve year olds: the sort of book I loved reading as a child, but somehow brought forward to a contemporary Australian setting. ‘Well, why don’t you?’ said the interviewer. If only it were that easy! There’s no doubt writing fantasy for Australian children is full of challenges and difficulties. For a start where do you set the story, when most of the classics of the genre are set in the Northern Hemisphere, and effortlessly draw on the myths, fairy tales and children’s culture of their native lands? In her earlier novel, CBC Book of the Year winner The Gathering, Isobelle Carmody managed to evoke a powerful sense of place by confining her plot to the primary world. In her new novel for young readers, Greylands, she deals with the challenge in a different way, one that acknowledges its debt to the past, with many references to Lewis Carroll and Hans Christian Andersen and several reworked fairy ‘stories within the story’. The primary world is the everyday world of school, home, neighbours, where Jack and his younger sister Ellen struggle to survive emotionally after the death of their mother, made worse by the complete withdrawal of their father. The secondary world is the ‘greylands’, the name that Jack gives to the world that lies on the other side of the mirror, a world without colour or smell, made up of reflected places, illusionary and fragmented. The device that links the world is the mirror, or mirrors, or reflections in windows. This confused me a little. I wasn’t sure why the device worked sometimes and not others, and why Jack sometimes awoke, as if from a dream, back in his own world. But the greylands are an unforgettable metaphor for grief, and one of the strengths of the story is its recognition of children’s emotions, especially the grief and guilt a child experiences after a parent’s suicide. Jack and Ellen are sympathetic characters, wise and loving in the manner of the heroes of fairy tales. Apart from Jack’s friend, Mario, they have no support from anyone. The adults that occasionally appear in the their world are one-dimensional, insensitive at best, if not cruel, part of the fairy tale style of the story, perhaps, or how adults seem to children numbed by grief. There are several themes that will be familiar to readers of The Gathering: that belief allows existence and that to laugh is to defy the darkness. The feral fear-scenting dogs of The Gathering have an echo in the mysterious wolvers that pursue people in the greylands and can smell wanting. And the overall theme has similarities too. Like the children at Cheshunt’s Three North School, the strange girl whom Jack meets and names Alice has been damaged by an adult culture that demanded she be ‘seen and not heard’. The tyranny of her parents has made her the lost, but still gallant, soul she is. The character of Alice and the nature of the mysterious bundle that she carries are typical of the powerful images that underpin this novel, images that are not always allowed to speak for themselves. One of the hardest things to achieve in fantasy is the balance of inner meaning and outer story. I thought Carmody’s images were strong enough to stand on their own without needing the explanations to which Jack and Ellen resort. 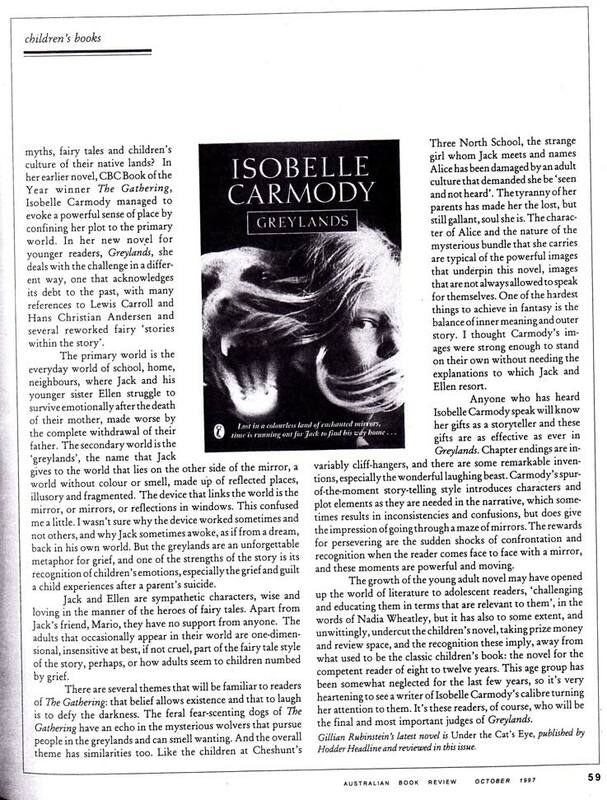 Anyone who has heard Isobelle Carmody speak will know her gifts as a storyteller and these gifts are as effective as ever in Greylands. Chapter endings are invariably cliff-hangers, and there are some remarkable inventions, especially the wonderful laughing beast. Carmody’s spur-of-the-moment story-telling style introduces characters and plot elements as they are needed in the narrative, which sometimes results in inconsistencies and confusions, but does give the impression of going through a maze of mirrors. The rewards for persevering are the sudden shocks of confrontation and recognition when the reader comes face to face with a mirror, and these moments are powerful and moving. 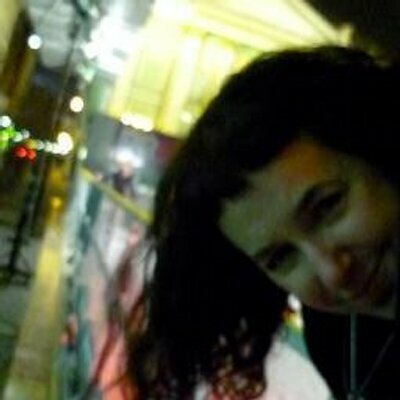 The growth of the young adult novel may have opened up the world of literature to adolescent readers, ‘challenging and educating them in terms that are relevant to them’, in the words of Nadia Wheatley, but it has also to some extent, and unwittingly, undercut the children’s novel, taking prize money and review space, and the recognition these imply, away from what used to be the classic children’s book: the novel for the competent reader of eight to twelve years. 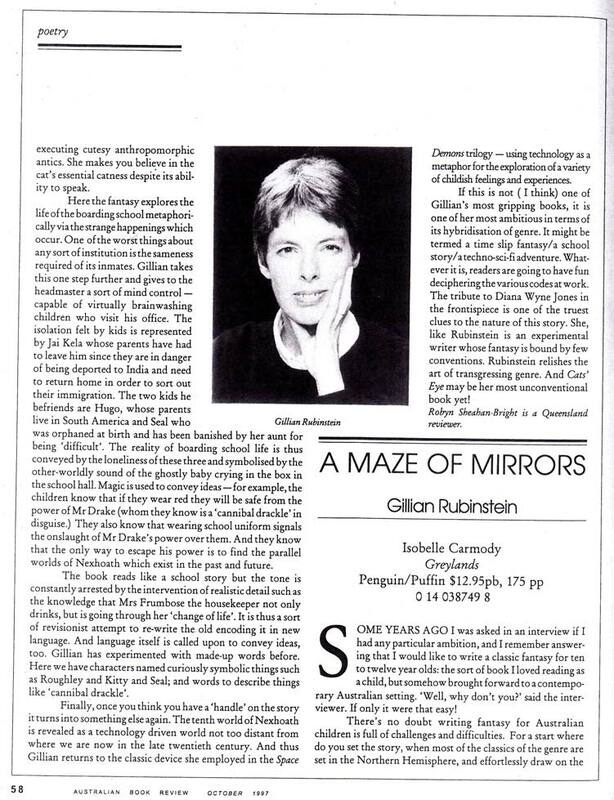 This age group has been somewhat neglected for the last few years, so it’s very heartening to see a writer of Isobelle Carmody’s calibre turning her attention to them. It’s these readers, of course, who will be the final and most important judges of Greylands.